I am Emily Bowie, a debut romantic suspense author. Please check out my Facebook page! I quite often let the nerd inside of me out. I love to digital scrap book (and do crafty things in general). I go overboard in taking photos of my family. I love being physically active (hiking, walking, being outdoors in general). But I HATE the cold! I live in Canada and close to half of the year I stay hibernating indoors. I am forced to find indoor places to stay active. The only thing that will get me out side when it is really cold is the pleading eyes of my children. 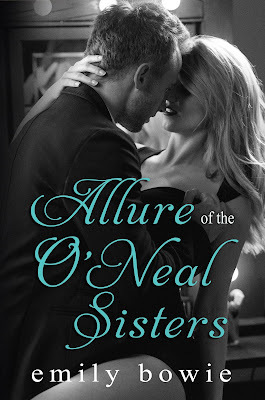 I actually started to write Allure of the O’Neal Sisters four years ago! It wasn’t until I had my second child that I decided to put in the push to finish it! A good friend of mine had just started her editing business and she encouraged me to have it edited and published. The O’Neal sisters have very different personalities. Payton, the wild child who doesn’t think through her actions, and Lilly, the one who gets Payton out of trouble. Deception, secrets and lies surround them when Jack Hewitt enters their lives. Jack is a long time thug who built himself up into the Castle family crime ring. His goal is to take as much as he can, destroying everyone in his path. Lilly, who just suffered a broken heart, falls for Jack. Unbeknownst to Lilly, Jack is playing her sister as well. Payton’s life begins to spiral out of control the moment Jack entered it. Her relationship with her sister, her career and her first true love slip away from her with each choice she makes without help from her sister and the people closest to her she could unwillingly vanish without a trace. I'm giving away a e-copy of Allure of the O’Neal Sisters! If you'd like a chance to win, please leave a comment! Giveaway ends 11:59pm EST Nov. 27th. Please supply your email in the post. You may use spaces or full text for security. (ex. jsmith at gmail dot com) If you do not wish to supply your email, or have trouble posting, please email maureen@justromanticsuspense.com with a subject title of JRS GIVEAWAY to be entered in the current giveaway. Great to meet you here Emily. It is so nice to meet and interact with new friends! Jack sounds like the ultimate bad boy and I'd like to hear more about him. I'm also curious to see how the girls handle it when they find out Jack is playing both of them. Thank you! The ebook is on sale this weekend! As for the sisters... Be definatly tests their bond!